Professional learning is integral to a strong instructional materials adoption, and even more important in guaranteeing that selected materials thrive in classrooms. Don’t take our word for it—ask Newport-Mesa Unified School District (NMUSD). 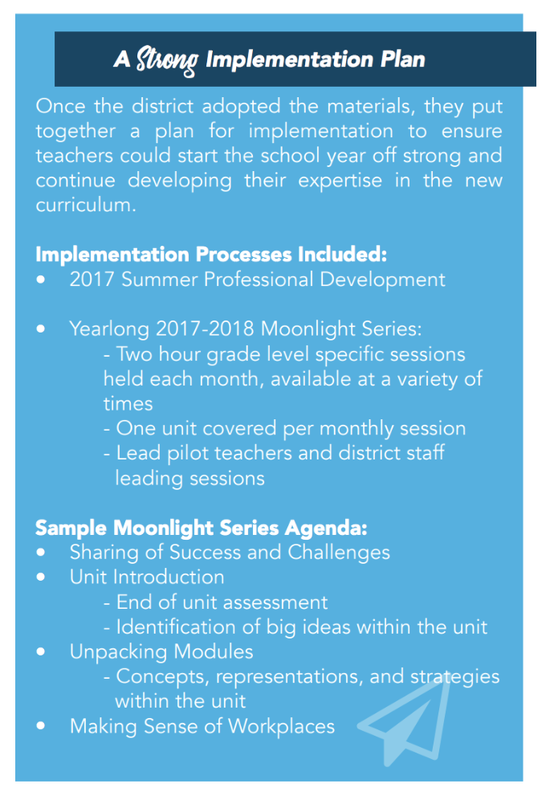 During its 2016 math adoption, NMUSD leveraged comprehensive, team-based professional learning throughout the process. Its story offers three examples of the power of professional learning to ensure that the materials selected are standards-aligned, that educator voice and expertise is effectively harnessed, and that teachers are supported in using the materials to best meet the needs of all students. From the beginning, Newport-Mesa Unified School District put the college and career readiness of their students at the center of the adoption. This meant selecting materials that were first and foremost aligned to the standards. Leaders knew they couldn’t decide alone. They put together a steering committee of educators with the charge of winnowing the field of potential programs to determine which two would be piloted by more than 100 teachers across the district. They also knew that this team needed a deep understanding of the standards and shifts in order to select aligned materials. To support this preparation, the district turned to its local county office, the Orange County Department of Education (OCDE), to work with the steering committee and provide extensive professional development in the math instructional shifts of focus, rigor, and coherence and to provide guidance on how to collect evidence in support of those shifts. Ensuring every member of the committee was well-versed in the shifts was vital to keeping alignment front and center. During the winnowing process, EdReports ratings and criteria became a guide for alignment as the group examined many possible programs to pilot. Using these criteria was in itself a learning opportunity; the team could apply its professional development in the shifts to reading the evidence about the shifts in the reviews. The focus on professional learning didn’t end with the steering committee. 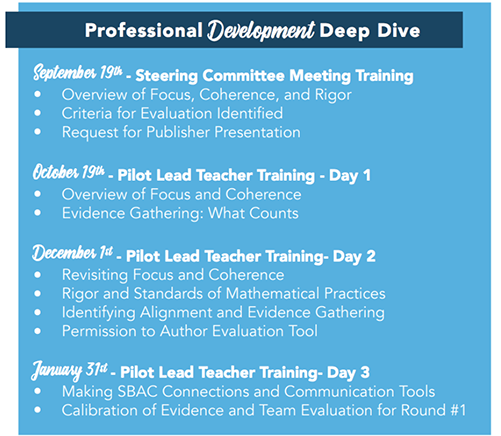 To continue building knowledge and shared criteria for evaluation, the 30 lead pilot teachers received additional intensive training in the math shifts, the EdReports review framework, and evidence gathering. Pilot teachers entered weekly data based on a rubric the steering committee had co-developed. The large swaths of evidence concentrated on alignment criteria and local needs. Without the professional learning offered by OCDE and the district, this approach to evidence collection would have been impossible. The pilot data would have been less reliable and less consistent -- leading to a less informed program recommendation to the board. What’s more, because of the depth and quality of the professional learning, evidence wasn’t simply collected, it was analyzed. Teachers and the district staff were able to identify trends in the materials, including gaps that might require additional professional development and support during implementation. The data the teachers collected and the experiences they had with the materials were integral in the district’s final recommendation to the school board. The commitment to professional learning continued even after the the curriculum was selected. Many districts consider choosing a program to be the end of the adoption process when really it’s just the beginning. NMUSD understood having quality materials means little if teachers are not supported in implementing them in the classroom. Working with pilot teachers and OCDE staff, Newport-Mesa developed a professional learning strategy that included summer and year-long sessions.